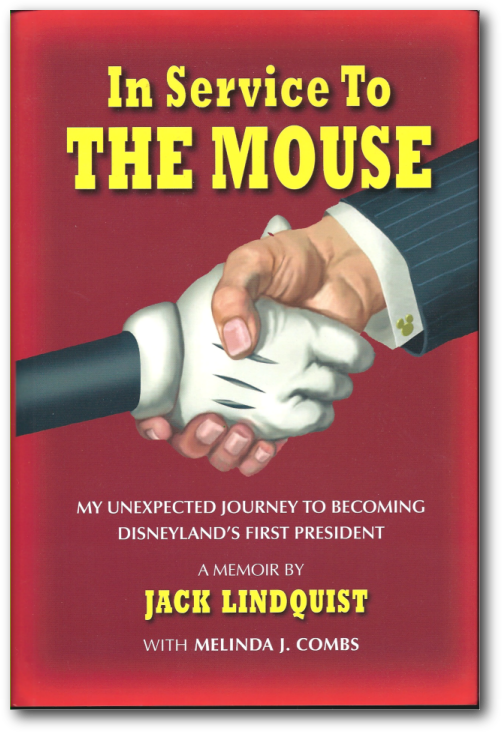 In Service to the Mouse: My Unexpected Journey to Becoming Disneyland’s First President, Jack Lindquist (with Melinda J. Combs), 2010, 248 pp. We are fortunate to have a profusion in recording the histories of the Disney company. Thanks to Didier Ghez’s Walt’s People series we have access to over 11 volumes of transcribed interviews with artists, animators, imagineers and many others that worked directly with Walt Disney. In the realm of Disney history we have our own rockstars, pioneers and elder statesman; for every Ryman, Hench, Sklar and Davis, we also have hundreds of people that made the Disney parks a reality through ignominious and daily work. Sometimes the person in question can reach a specific level and affect a specific part of the company in a greater way. Hopefully, that person will set down their thoughts and reminiscences in a memoir. Memoirs are one of my favorite types of Disney-related books because you often get the gritty stories that official publications can’t relate. As with any personal recollection you have to be smart when you read. Not every conversation or anecdote happened as reported. That said, In Service to the Mouse is a good read and Lindquist relates many stories that have not been shared before. Lindquist takes us on a chronological journey of his career working at Disney. Like other memoirs about Disney artists and cast members, the book shines when you read about the events that seem to have a larger role in the company’s history. You get a feel for how organic Disneyland was and how everything grew based on need, trial and error. Lindquist started as an advertising manager and ended his career as the very first president of Disneyland. Lindquist takes the opportunity to dispel a few myths and seems to revel in the time he spent orchestrating Disneyland and many of the local programs like grad night and civic days. Lindquist was on the team sent to get approval and funding for EPCOT Center’s World Showcase pavilions. The stories he relates really show that no one had ever taken on such a large project that worked with so many disparate countries. In some cases, the team spent weeks waiting to speak to a dignitary or royal family member to show them the concept artwork and models. Most of the book does focus on Disneyland and you get a sense that Linquist did have some struggles promoting Disneyland the way he wanted after Walt passed away. The memoir is bittersweet in many ways, but he never shies away from speaking his mind–even if it appears contrarian or not quite in the Disney spirit. Lindquist always wanted what was best for Disneyland, though, and that shows in the stories. It is an enjoyable read and it is ideal for Disneyland fans and historians looking for any information about Disneyland. Looking for other Disney-related memoirs?